The summer’s swelter is dying down but that doesn’t mean the fun has to. There’s still plenty of time left to get wet and wild with a local white water rafting trip. Suit up and grab your floatation devices because you’re about to beat the heat once again, get a good dose of adrenaline and make memories that will last a lifetime. Read on to find the perfect guide and river ride for your crew. With over 35 years of experience under their belts, your family is bound to feel safe and excited about hitting the rapids with the River Drifters guides. This company has been rafting with families since 1979 and promises a personal touch. They welcome children as young as 4 years-old and grandma and grandpa are even welcome to join in. If you are worried about safety, take comfort in knowing that they are experts when it come to picking the right trip for your crew’s abilities. They make sure every person in the family has the gear and information they need to stay safe while having the time of their lives. 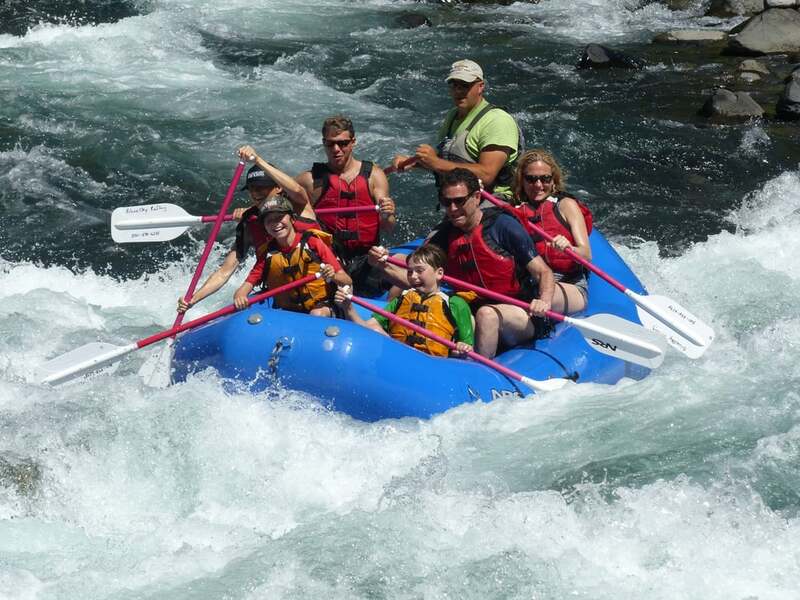 Full and half-day rafting trips on the Deschutes River are available for families who are willing to make a quick drive. The Deschutes is one of the most popular rivers in Oregon and promises a trip through the beautiful desert landscape and plenty of sunshine. These trips are perfect for first timers, and booking ahead is advised. Based 30-miles from Portland, Blue Sky has Oregon rafting adventures designed specifically for families. Choose a half-day rafting experience or spend your whole day navigating the white caps of the Clackamas. Whether your family is filled with beginner or advanced paddlers, there’s something for you. According to the professionals at Blue Sky, the Clackamas River is perfect for young kids in the summer: the water level is less intimidating, the weather is warm and their s plenty of time for having a whole lot of fun. If your group includes older kids that need a little more excitement, the guides will pick a boat that guarantees a wet and wild ride. If you run the Clackamas and want to try something new, N. Santiam River is a favored family spot. Blue Sky staff suggest that you wear a swimsuit and t-shirt for your ride. Remember to bring shoes (wetsuit, booties, river sandals, aqua socks), hat for sun protection, sunscreen and water. White water rafting is perfect summer experience to share with your loved ones and Ouzel Outfitters has a suite of trip options that are sure to fit your crews needs. Go on a multiple-day trip down the Rogue, Deschutes, Lower Salmon, John Day, Owhyhee or North Umpqua Rivers. Stick to a half-day or full-day trip that lets your see your favorite wilderness area from a new vantage point, or have the professionals at Ouzel put together a private custom trip for your family reunion or a birthday party. Ouzel is known for being run by highly organized professionals. When you travel with them you get a full-service and fully-outfitted experience. This means they provide all of the equipment and meals and help you arrange for anything you might need. You can expect the coziest of sleeping bags and extra padding should you choose and overnight excursion and they are happy to accomodate your dietary needs as well. Has your family gone white water rafting? Share your experience with us in the comments below.